hydrate and cleanse your skin. . .
Facial steamers open pores for a deep cleaning and rehydrate the skin. 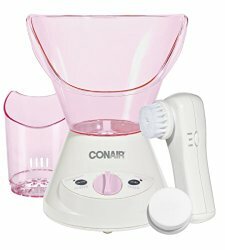 A regular facial sauna with a steaming device or simply over a bowl of steaming water is a quick and easy way to keep your skin glowing. Steaming has a long history as a quick, easy method for a deep cleansing of the pores and keeping the skin well hydrated. Steaming opens the pores, allowing deeply embedded impurities be gently steamed away. It is also an excellent way to stimulate blood circulation as well as increase the moisture content of the skin. Rehydrating the skin through steaming helps to stimulate the cells which, in turn, helps to improves skin tone and elasticity. Goodness knows that aging skin needs as much moisture as possible! A home facial steam is a very effective spa treatment, so don't be shy about indulging yourself. Home spa treatments for aging skin should actually be considered as a necessity for effectively rejuvenating aging skin. Choosing a Facial Sauna that is right for you. . . When selecting a facial sauna, choose one that produces cool steam or at a minimum, one that you can adjust the temperature of the steam. You want to make sure you are only steaming your skin, not scalding it! 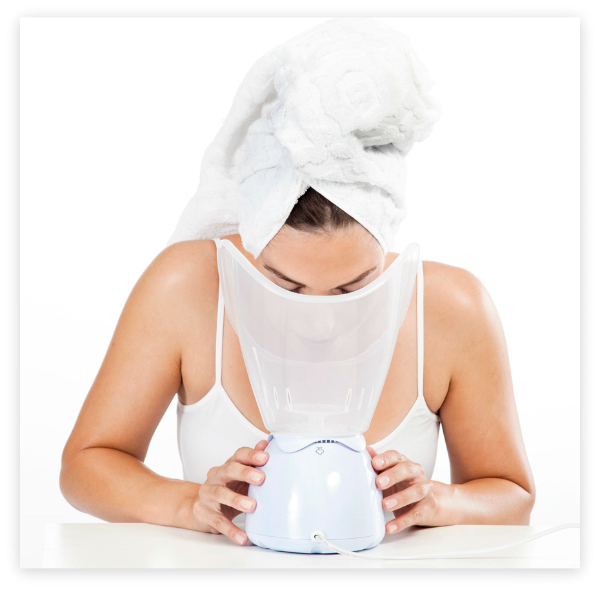 Facial steamers are readily available just about anywhere you shop. The familiar and traditional table top model with a flared face cone that directs steam from the forehead to the chin. A hand-held model to directs mist to specific areas of the face. Table top facial sauna spa systems produce steam quickly and allow for the addition of natural rejuvenating ingredients like herbs, and essential oils for additional benefits. 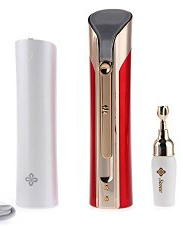 Hand held versions are either battery operated or have a rechargeable feature. Although very convenient, the draw back is that they don't steam the entire face all at once nor is the steam hot but more of a mist. 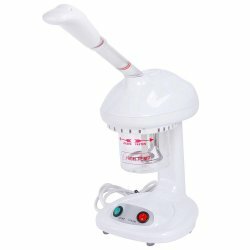 Many models of either option include a variety of handy, dandy attachments to scrub and tone your skin after the steaming. Of course, the tried and true simple yet effective alternative is. . .
. . . a large bowl or sink filled with steaming water and placing a towel over your head like a little tent to capture the steam. Add anti-aging rejuvenating herbs, oils or other natural ingredients to provide your skin with a blast of antioxidants, emollients, and even an antibacterial treatment to improve your skin's overall health and natural glow. strategy for a particularly deep cleaning. Cleanse, and then proceed with your chosen skin care regimen.